Ready to get stronger without damaging your hands in the process? MRX Boxing & Fitness has created a durable pair of sailing gloves that allow you to get full use out of your hands without getting hurt. Our specialized sailing gloves come in a number of sizes and colors that can be suitable for both men and women. You’ll love the waterproof, breathable cloth that works for hot weather and water sports while also preventing rope burn, bruises, and calluses. In addition to being suitable for gym workouts, these gloves are also great for gripping wet surfaces, like kayak paddles, which makes them ideal for water sports, including water skiing, boating, and kayaking. Our gloves are made to fit tightly without affecting mobility. 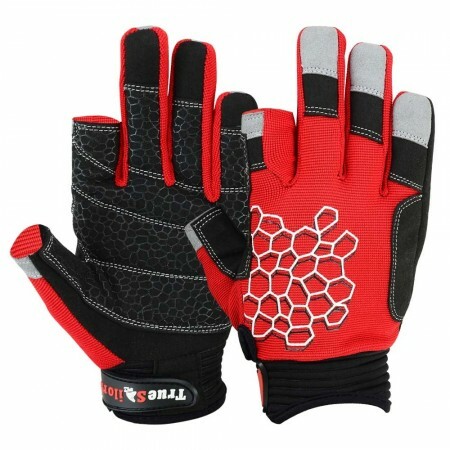 These gloves allow for the flexibility and dexterity that you need to perform optimally. They feature a reinforced palm and a hook and loop for secure closure and a long strap, ensuring proper fit and wrist support. The short finger gloves give you the freedom to tie knots and have full dexterity for when you need to perform fine motor movements. At MRX Boxing & Fitness, we take great pride in helping fighters and athletes improve their strength, endurance, striking power, and success in fitness endeavors through our huge range of gloves, MMA products, and weight training gear. We want to help you perfect your workouts and stay on top of your game. We accomplish this through our top-quality products that are built to withstand heavy abuse so that you can perform your very best. ➤PREMIUM PROTECTION FOR HANDS: Your hands are one of your most important assets. They allow you to do the things you enjoy doing every day. That’s why these sailing gloves were created to protect your hands when rowing or paddling gets especially rough. The gloves keep you safe from rope burn, bruising, calluses, and more to ensure your endurance. ➤ALLOWS FULL DEXTERITY: You rely on your fingertips for a variety of tasks. That’s why these Loose / 2 cut fingers so that you can use your fingertips to tie knots, bait a hook, or shoot a gun. With this kind of dexterity, you can even type on your cell phone and carry out fine motor activities while still wearing the gloves. ➤PERFECT FOR WATER ACTIVITIES: In addition to exercise and weightlifting, these gloves feature a sticky palm grip that makes them great for gripping wet surfaces, such as kayak paddles. This pair of gloves is ideal for water sports, so whether you’re water skiing, boating, or kayaking, you’ll have full control of all your slippery gear. Add them to your water sports accessories today. ➤QUALITY, DURABLE & FLEXIBLE: These gloves are made from high-quality materials, including premium, flexible Amara fabric and a 4-way Spandex cloth printing design. The palm is reinforced with this Amara fabric, providing you with a nearly indestructible product. This pair of gloves features a hook and loop closure, ensuring a secure, tight fit with a long strap for extra wrist support. ➤ABOUT MRX BOXING & FITNESS: At MRX Boxing & Fitness, we provide products that improve strength, endurance, striking power, and success in fitness activities. We carry a full range of gloves, MMA products, and weight training gear to perfect your workouts. Our top-quality products are built to withstand abuse so you can perform your best. We offer fast, same-day shipping on all orders and 100% satisfaction.